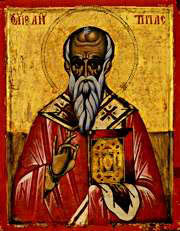 Saint Antipas was a contemporary of the holy Apostles, by whom he was made Bishop of Pergamum. He contested during the reign of Domitian, when he was cast, as it is said, into a bronze bull that had been heated exceedingly. The Evangelist John writes of him in the Book of Revelation, and says (as it were from the mouth of Christ, Who says to the Angel [that is, the Bishop] of the Church of Pergamum): "I know thy works, and where thou dwellest, even where Satan's seat is; and thou holdest fast My Name, and hast not denied My Faith, even in those days wherein Antipas was my faithful Martyr, who was slain among you, where Satan dwelleth" (Rev. 2:13). The faithful pray to this Saint for ailments of the teeth. Share the feast of Antipas, Bishop of Pergamum with an icon greeting ecard.